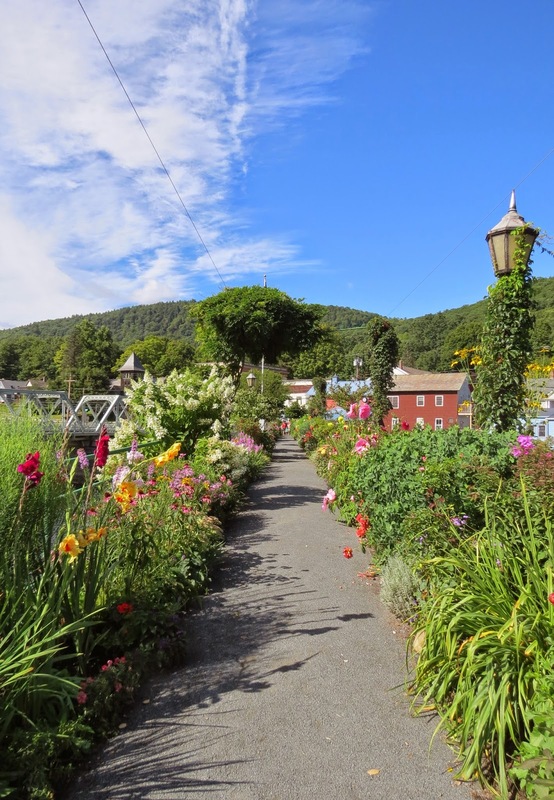 Today our journey takes us along the "Mohawk Trail", Rte 2 in western Massachusetts. 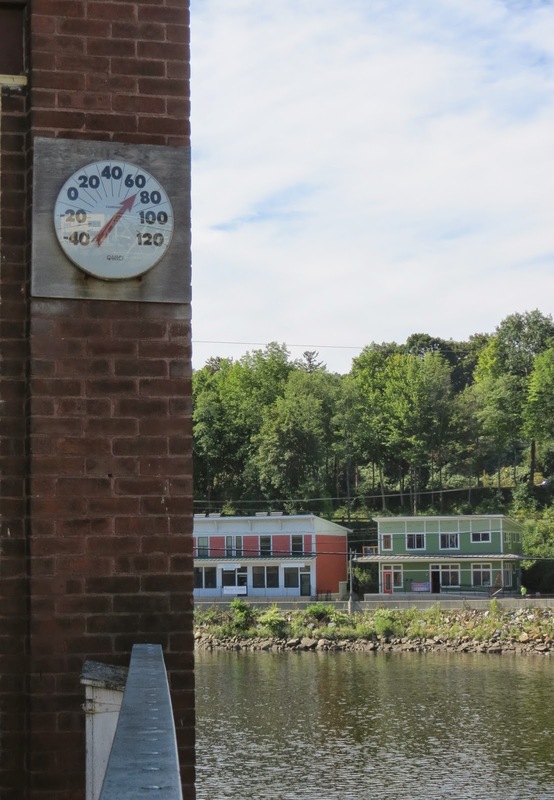 This route was once a Native American trade route connecting the Atlantic tribes with tribes in upstate New York. 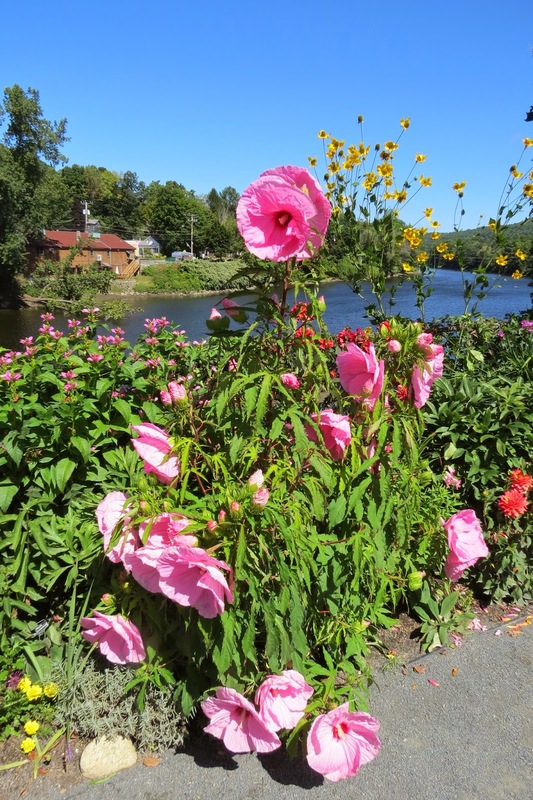 Our destination is the town of Shelburne Falls to see some ancient glacial potholes and the Bridge of Flowers. The weather was a perfect 70 degrees for a walk around town. We'll start our tour at Salmon Falls, once a shared fishing spot among Indian tribes. And also the site of some very old potholes formed during the glacial age. On the way to the viewing area I passed two glass mosaics. This one depicts the American Indians fishing at the falls. And this one a more modern portrait of the river. Of course there is a dam here now, and my first glimpse of the potholes is below the spillway. Looking down toward the falls where water comes through the dam. I love the swirly colors in the rock surrounding the potholes. Swimming was once allowed below the falls and in some of the larger potholes, but I guess there were too many injuries, and is no longer allowed. There are flowers blooming all around town. These roses were growing along a fence near the river. Various forms of artwork were seen in odd places around town too. But first some history: This bridge was once a trolley bridge, built in 1908. The nearby iron bridge had only a 20-ton weight limit. 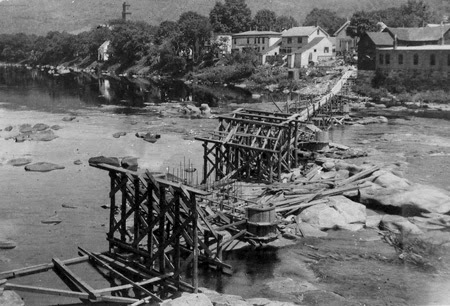 The five-span, 400-foot concrete arched trolley bridge, connecting the towns of Shelburne and Buckland, was constructed to help deliver heavy freight from the Shelburne Falls railyard to the mills on the 7 1/2-mile line along Route 112 North to Colrain, as well as passengers and local goods, such as milk, apples and cotton. The trolley did its job, but became obsolete with the invention of the automobile, as goods began to be transported by truck. 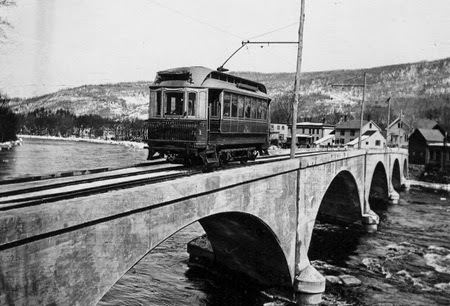 The trolley company went bankrupt and ceased operations in 1927. 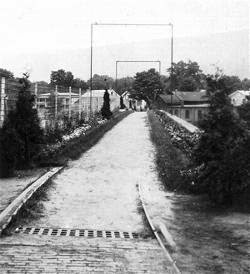 By 1928 the abandoned bridge had become an eyesore, overgrown with weeds. 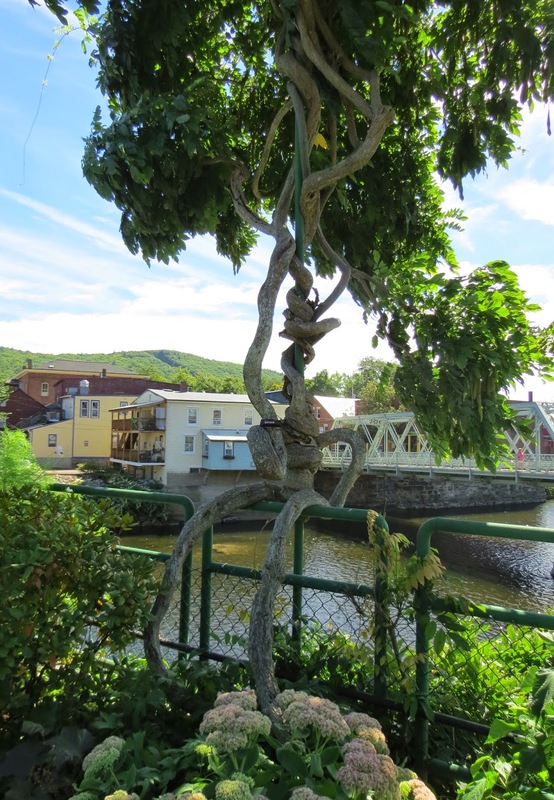 Enter the Shelburne Falls Women's Club who sponsored a project to transform the bridge from an eyesore to a "bridge of beauty." They raised money, brought in loads of loam and fertilizer, and volunteers planted the Bridge of Flowers, seen here at its beginnings. Today you enter via this shady walkway, complete with places to sit and read or meditate. A "pothole" fountain with floating blooms. No dogs are allowed on the bridge. Flowers bloom all during the growing season. Looking over at the old iron bridge, used by cars to cross the river. A glimpse of the Deerfield River. She's as pretty as the flowers. The sign says, "Thyme on the River." Another mosaic depicting the Bridge of Flowers. 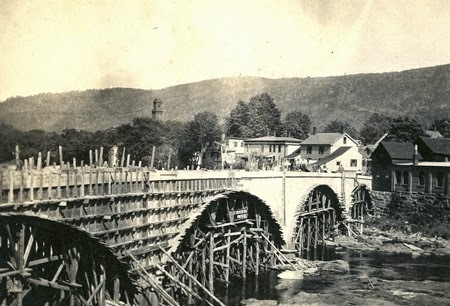 The circa 1890 iron bridge. Don't think I'll be driving my RV across it. A view of the dam from here. Looks like they are doing some repairs under the bridge. A view from the hill across the river. So what happened to the trolley? You can find out at the Trolley Museum. Except it's only open on weekends, and today is Wednesday. So you can find out on the internet. Saved by a farmer, it served 65 years as a chicken coop, tool shed, and playhouse. 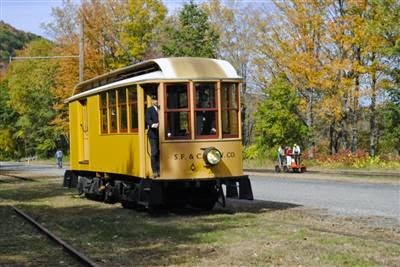 Now, thanks to the efforts of the Shelburne Trolley Museum, it has been restored to its former glory, and you can even ride it in the same freight yard where it used to load and unload passengers, mail, milk, apples and other freight…but only on weekends of course. You can also climb on the old red caboose. And peek in the window. More flowers growing around town…these big sunflowers were hanging over the sidewalk. More mosaics depicting nearby towns. Walking toward the dam on the other side of the river. This was/is the factory of Lamson and Goodnow cutlery. The outlet store is open. A view of Salmon Falls from the dam. The river below the dam. And another view of some potholes. Inside the Cutlery store…a letter from President Grant in 1869, complimenting the company on its fine craftsmanship. Very nice looking kitchen knives, but I didn't need any. Walking back to the bridges. back across the Bridge of Flowers. All of the flowers were labeled which was nice, because I didn't recognize most of them.